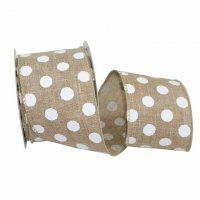 White Polka Dot Ribbon printed on Linen Ribbon with a Matching Wired Edge. Use this wonderful White Dot Ribbon on everything from wreath ribbon to gifts & everything in between! !